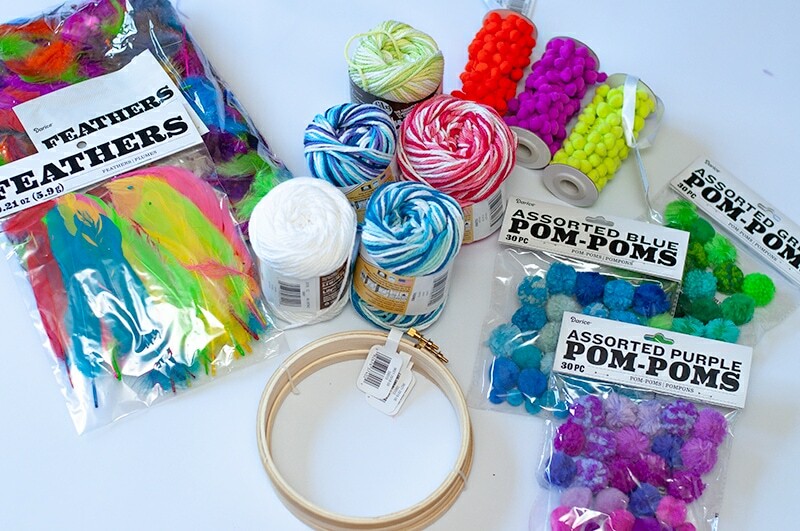 I’m at it again sharing another super easy Summer camp craft! 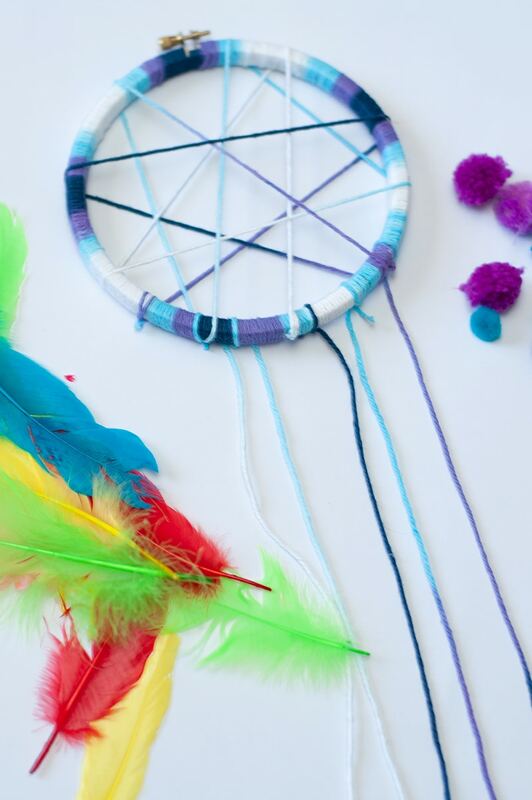 This simple to make dream catcher project is the perfect Summer camp craft for kids of any age. Make sure to stock up on lots of great items for this craft and lay it all over the tables, so the kids can get super creative. They will have so much fun making their own dream catcher project to take home. Step 1. 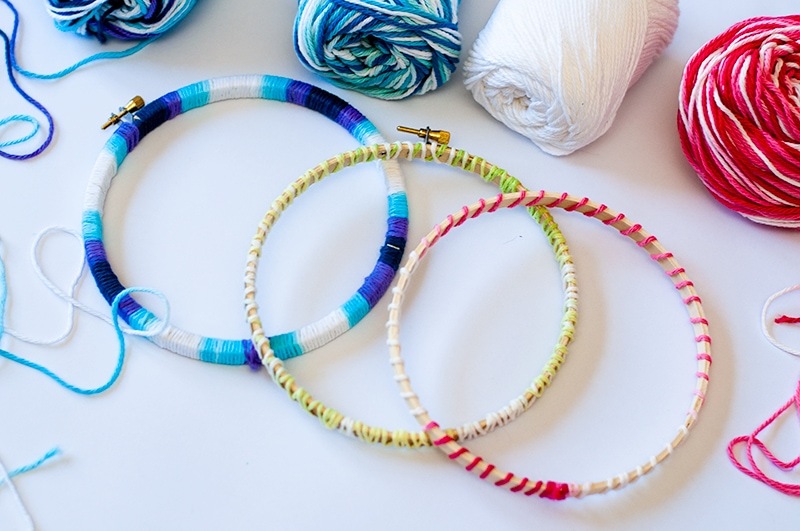 Pick the size embroidery hoops you want to use, I think the 6″ is a perfect size for a camp project. It will work perfect for kids of all ages. Tip: If you separate the hoops then you’ll have two instead of one! Step 2. 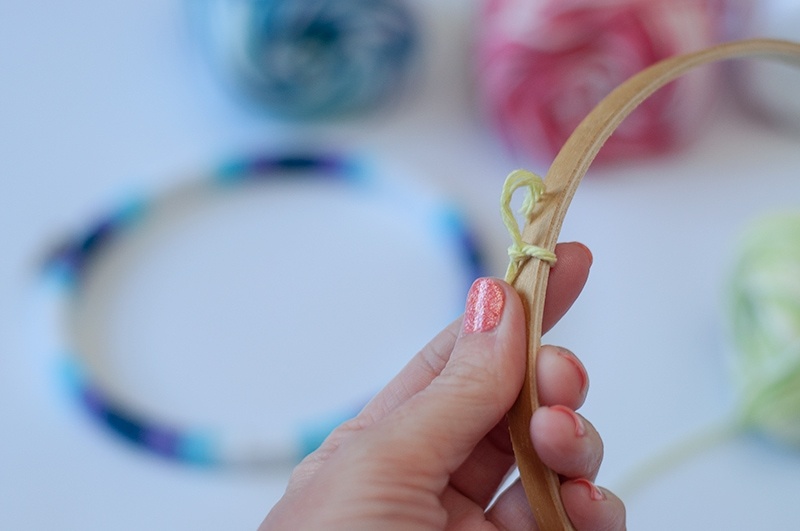 Tie a knot on the hoop and have the kids start wrapping the yarn around. Once they’re done adding their yarn, tie into place. 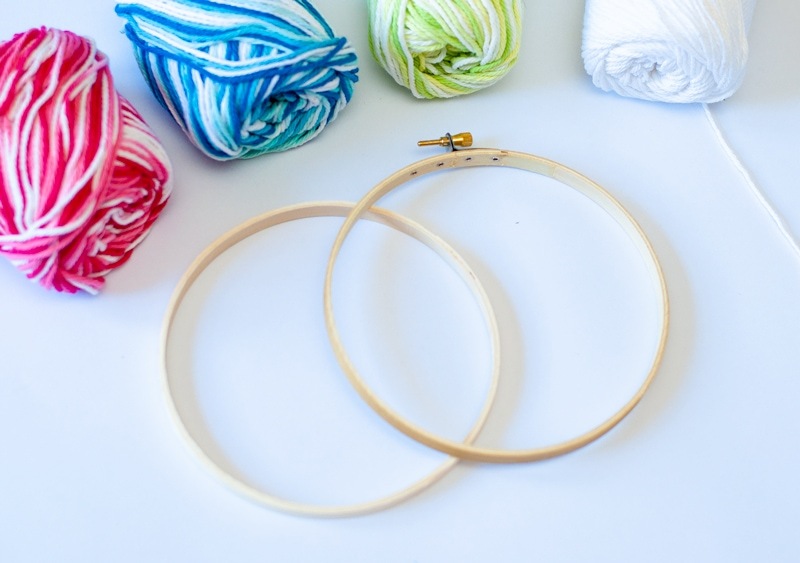 You can have them add as little or as much yarn around their hoops as they like. I’m sure the older kids will get a little more creative with their Dream Catchers! If you have younger kids you could even leave the hoops bare if you want to save a step. Step 3. This part was super easy, make sure to pre-cut a bunch of pieces and lay on the craft table. Have them start wrapping the yarn around the outside of the hoop in a web pattern and tie to secure it. Tip: Have a hoop so that you can demonstrate this step to the younger kids. Step 4. Now it’s time to add the bottom of the dream catcher. Make sure to stock up on lots of supplies like I listed above for this part! Let the kids get as creative as they want! 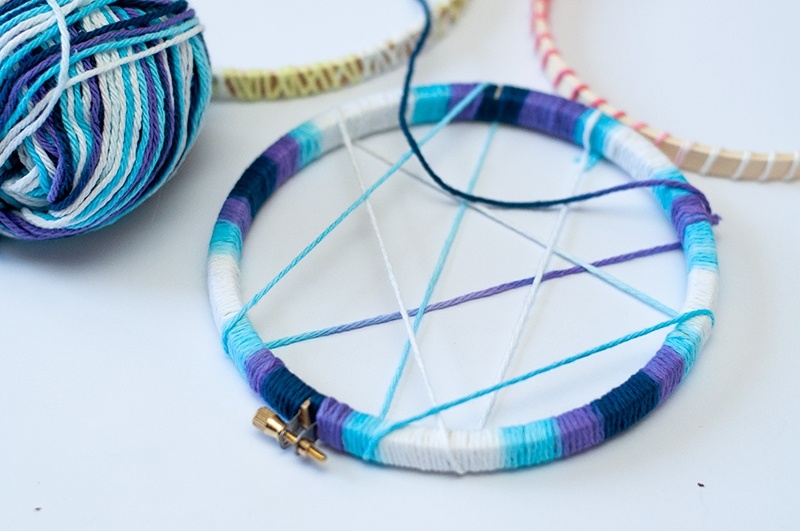 Tie some of the yarn on the bottom of the dream catcher at different lengths. This is a perfect opportunity for the older camp helpers to assist the younger kids. 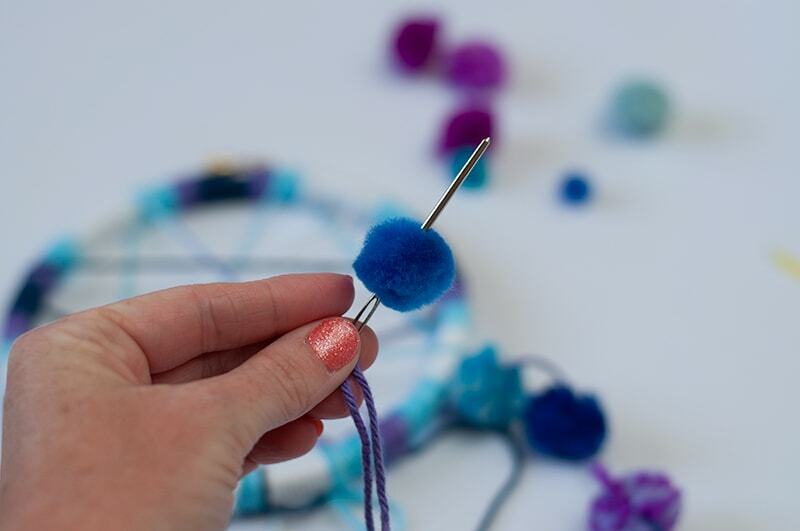 When adding the pom pom balls, make sure to use a large needlepoint needle. If you have younger kids, make sure to have helpers assist them. Here are three different styles to use as inspiration! I would recommended making a couple beforehand to show the kids. I love the touch of the pom pom garland, it’s my favorite! One of my favorite things about this dream catcher project is you don’t need any paint or glue! Now that’s a perfect Summer camp craft to me! 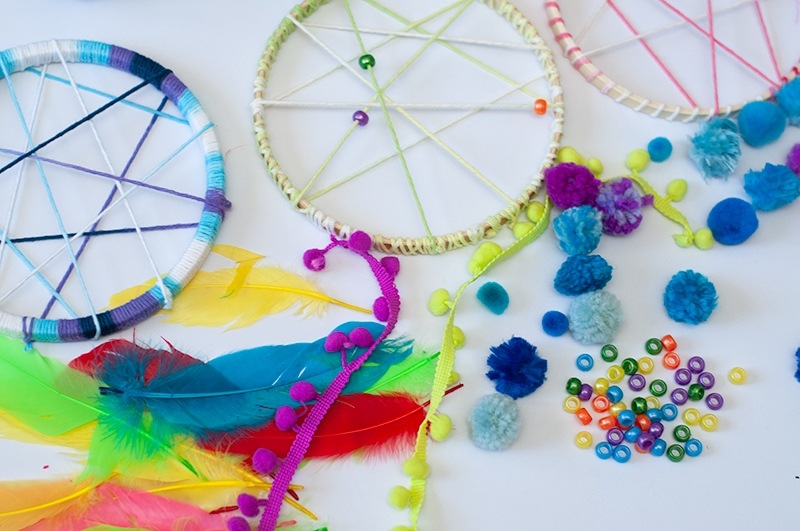 Now they can bring it home and hang above their bed or on the wall, you could even go into detail about what the dream catcher means while the kids are making their craft. Looking for another easy DIY Summer camp craft? Check out these DIY Tote Bags I made last month that the kids can personalize on their first day of camp! If you have any Summer Camp or VBS questions or need tips, I’m your girl. Shoot me a message and I’ll help any way I can!